Whether you plan on retiring early or working into your 80’s, we all need to be purposeful with our retirement planning. The mass media is replete with tricks that claim to help you achieve that million dollar portfolio (truthfully, that number is likely on the small side) and set sail into retirement so you can live the life you’ve always dreamed of while you slaved away at your day job. I have lived long enough though to know that there are no genuine shortcuts when it comes to retirement planning. 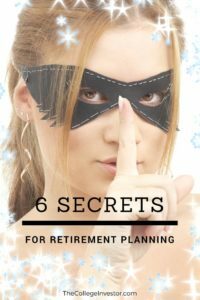 However, there are some simple principles that will help you advance down the path of the retirement plans you do have. While the things mentioned here are not exhaustive in nature they are meant to help get your mental juices flowing as to how you can set up an effective strategy so your investing and saving will get you closer to those retirement wishes you do have. Time is one of the most overlooked aspects of investing and even more so with investing for retirement. While there may be some legitimate excuses why some people don’t start investing in the stock market earlier in their lives, that generally should not become an excuse for staying out of the market altogether. The key is to start as early as possible, even with your first job out of college if possible. If your job provides a 401k match that can be one of the best options as it’s free money and can take little maintenance to upkeep. Outside of that, you also generally have the opportunity to start investing in an IRA. Even if the amount you’re able to put away is small, start with that and you’ll not only develop an investing discipline, but you’ll also be able to take advantage of time. By starting early you’ll be able to benefit from the magic of compounding your money which will only do so more the earlier you start. We call this strategy front loading your life. I am not talking about investment fees, that’s for the next section, but I am talking about your day to day life. I am talking about the spending decisions we all make on a day to day basis. You may enjoy eating out twice a week, but have you figured out what that will cost you in terms of your retirement planning when looked at on a long term scale. A budget can help you with setting priorities, but even if you do not like to budget you should still look at your spending habits and see how you can shift some of those to investing instead of spending. This is not to mean that you can’t enjoy life, but it requires determining your priorities so you can build up a nest egg as opposed to spend foolishly. This is another area where you can really derail your retirement planning as investment fees can take a bite out of your returns. While mutual funds may be somewhat waning in popularity they are still popular investment vehicles for many. There are some great mutual funds to hold, but the expense fees do add up over time if left unchecked. This is not to say that their counterpart – the ETF is always sterling as there are ETFs that can be rife with expenses. The key is to do your due diligence before investing in any product and make sure the fees are not outrageous. If you prefer to pick stocks to invest in then try and avoid needless trading that will rack up high commissions. We recommend using a free service like FeeX to examine your investing fees and make smart choices on alternatives. Before I took the leap to running my own business I would increase my 401k percentage once a year by 1%. Many 401k plans make this quite easy to accomplish and you can often just automate this so it will increase at a certain date each year which frees you from having to remember to do so. This has the dual benefit of investing more each year, but is also small enough that you are less likely to “feel” the increased amount taken out of your paycheck each pay period. If you do not have a 401k plan to take advantage of then you can also accomplish investing more by looking at maxing out your retirement accounts. Maybe you were only able to save $3,000 last year, so why not go for $4,000 or even more? This might seem like a small amount, but if you’re committed to it and do it each year, up to the point that you’re maxing them out, then your retirement planning becomes that much more effective. As your portfolio ebbs and flows throughout the year there is the possibility that your allocations can get out of whack. If left unchecked you could end up being invested more heavily in one investment type over another. This is where analyzing and rebalancing your portfolio on some specific interval is helpful. Some suggest doing this quarterly while others recommend annual rebalancing. Find what works for you and go for it. This, of course, is to be done with knowing your risk tolerance and how your asset allocation fits in with that and adjusting it as your risk appetite changes. If you were looking for some special secret to take your retirement planning to the next level, I am sorry there was nothing super secretive as they all essentially boil down to hard work. Saving for retirement does not happen overnight and is more a marathon than anything else. It takes hard work, commitment and a long-term view of your priorities coupled with your finances. If you are looking for how to save for retirement it really does boil down, on one level, to hard work. Unless you win the lottery it’s not going to come in one big windfall, but it is going to come through a lifelong commitment to amassing and building your portfolio that will have the ability to weather the storms the stock market throws at it so you can best enable yourself for your life after work. What did I miss? How would you describe effective retirement planning? John Schmoll is the founder of Frugal Rules, a Dad, husband and veteran of the financial services industry. He's passionate about helping people learn how to make wise investing decisions so they can prepare for their futures and avoid the mistakes that he and so many others have made. John excellent post. As an advisor who focuses on helping people plan for and manage their retirement you’ve hit the major issues very well. Thanks for your kind words Roger! Time is the most important element in investing. It offsets many mistakes, stock market volatility, bear markets, etc. It is the most overlooked aspect of investing because so many people think they can catch up later. That is a great point KC! I know that I wish that I would’ve started earlier and I believe that time is the most often overlooked element to investing. It is too late for me to get an early start. My retirement saving plan now is to keep my expenses very low and save at least 50% of my income.